Cambridge made the top three for Most Beautiful Large Town in the NZ Beautiful Awards. 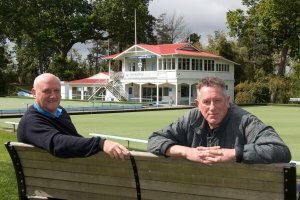 Cambridge’s unique beauty has been recognised at a national level, being named a finalist in the Beautiful Awards, run by Keep New Zealand Beautiful. Making the top three for Most Beautiful Large Town, alongside Feilding and Kerikeri, Cambridge was recognised for its excellence across all award criteria; environmental action, community beautification, heritage conservation, community engagement, historical beauty and tourism. “Cambridge’s natural beauty is inspiring and the work the community does in maintaining this beauty is fantastic! Not only this but it’s great to see that it’s becoming such a centre hub for locals and tourists alike,” said one of the judges, Heather Saunderson. “Whether we win the award or not, I’m delighted we made the shortlist of three,” said Josh Easby, a Cambridge local who entered the town in the awards. Josh Easby (left) and Michael Jeans nominated Cambridge for the Beautiful Awards. “I’ve always loved the town so writing the competition submissions was easy – I just had to get my enthusiasm for Cambridge across to the judges,” said Josh, who has been a full-time local for the past 8 years, having travelled the country with his wife Wendy looking for the perfect place to settle. With help from local organisations ranging from the Waipa District Council to the Cambridge Tree Trust, the group compiled a compelling case for Cambridge. The judges said they were particularly impressed by the calibre of the supporting photo slideshow, taken by local photographer and volunteer Michael Jeans. “The calibre of entries for the 2017 awards has been very high, which has made judging extremely difficult,” said Saunderson. The awards evening is set for Friday, October 13 in Hastings.